Ever wondered how's the best insurance agency leader in the whole of Asia? Looking to join the best manager if you are interested in becoming a financial advisor? Well, according to the "Asia Trusted Life Agents and Advisers Awards", Mr Gabriel Tan from AIA Singapore is the Agency Leader of the Year. For having demonstrated a consistently high level of group production and recruitment, for leading his agency to repeated accolades and for displaying a commitment to professionalism and service to the industry, Mr Gabriel Tan is a worthy winner of the Insurance Agency Leader of the Year. 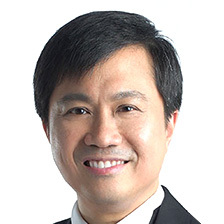 A 26-year veteran of the industry, Mr Gabriel Tan has been AIA Singapore’s Top Group Financial Services Director (FSD) for three consecutive years. Last year, he led his district to achieving the top number of recruits totalling more than 170 Financial Services Consultants (FSCs). Under his leadership, Mr Tan has groomed 18 Personal Wealth Managers (specialising in the High Net Worth market) and his agency won the Top District with the highest number of Personal Wealth Managers. Mr Tan’s strong leadership qualities can be observed over the years. He has guided seven of his FSCs to becoming some of AIA Singapore’s most successful FSDs and has also developed many successful Financial Services Managers, creating one of the most dynamic agencies at AIA Singapore. He has attained his Chartered Financial Consultant (ChFC), Chartered Life Underwriter (CLU/S) and Certified Financial Planner (CFP) designation in his journey of continuous learning and elevating his skills and professionalism. A committed leader, he is also a Fellow of the Insurance and Financial Practitioners Association of Singapore (IFPAS), a member of the Society of Financial Service Professionals and was an EXCO member of the Public Awareness Committee in the Financial Planning Association of Singapore (FPAS). competent FSCs, able to provide customers with comprehensive financial health checks and suitable financial solutions to help meet their needs. Always generous in sharing his knowledge and expertise, he is regularly involved in various company and leaders’ work groups to provide constructive inputs. To reach out to more people to share the importance of financial planning, Mr Tan also lectures at the Singapore College of Insurance and Temasek Polytechnic, and has delivered talks to the Singapore Armed Forces, the Ministry of Defence and the Singapore Police Force. He is also a regular speaker at various seminars and contributes articles to the media to share his great wealth of knowledge and experience to the greater public. His outstanding track record and leadership skills, not just in leading his own district but also in grooming more leaders and elevating others to success, makes Mr Tan deserving of recognition as the Insurance Agency Leader of the Year.